If you’re running a business, this is a perfectly valid question to ask. Why pay a subscription for your Office tools, rather than a one-off fee for a copy of Office 2019 or, indeed, an older version? In fact, why not just use a free solution like OpenOffice or LibreOffice? And what about online apps such as Google’s G Suite or Microsoft’s very own Office Online? 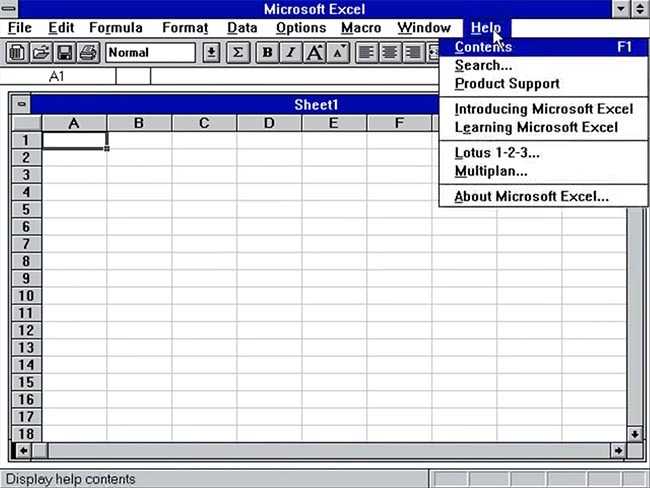 A very, very old version of Excel. Recently, we were reading the comments of an online article about Office 365, and we saw that several people claimed to have no need for it, because they were still happily using older versions of Office – including someone running Office 2003 in a virtualised Windows XP. Others, meanwhile, are content to use free office tools to get work done. How come? Simply put, if you’re an individual who needs to write the occasional letter or who uses spreadsheets every now and then, a free application is probably fine and an old version of Office will do the job too. Businesses, however, have greater needs than individuals. A sole trader could perhaps get away with using free software, but technically they shouldn’t use anything that isn’t licensed for business use. Even if you pay for a consumer copy of Office 2019, you’re breaching the user agreement if you use it for business. Aside from this, there are more compelling reasons to use Office 365 instead of an offline alternative. Security updates, which you won’t get for older, unsupported versions of Microsoft Office. As a cloud solution, you can access Office 365 anywhere, including on mobile devices. Mobile apps aren’t available for offline versions of Windows. Files are automatically saved, with the ability to roll back to earlier versions and undo deletes. Every user gets 1TB of OneDrive online storage. It’s constantly being updated with new features, which isn’t the case with Office 2019 and its predecessors. It’s higher quality than free office suites, backed by the security expertise of Microsoft. You get better support than you would with a free solution. Exchange Online simplifies email and adds security. Additional software such as SharePoint and Planner make Office 365 more than just a simple office suite. If you want the convenience of cloud software, Office 365 is a great choice, but it’s not your only option. Notable examples include Zoho Online Office Suite and Polaris Office Online, but the G Suite is the most popular alternative, Microsoft Offline is another possible option, and LibreOffice is worth a closer look, being free and open source. The G Suite is quite an impressive set of cloud-based applications, including basic office solutions, online storage and mobile apps. For sole traders, a free account might be okay, but using an @gmail.com email address will look unprofessional, and you won’t be entitled to much support, if any. If you wanted to use the G Suite for business, then it would be best to sign up for a paid account. There are three plans: Basic, Business and Enterprise. It’s these services that are designed to compete with Office 365. Microsoft offers a range of business plans with varying features. Microsoft Office Online is a stripped back set of web apps, which is meant to rival Google’s own free offering. With it you get lightweight versions of Word, Excel, PowerPoint and OneNote. Now there’s a free version of Microsoft Teams, you could also add that into the mix, if you wanted. For sole traders and occasional users, Office Online might be sufficient, but it’s really designed for casual consumers only. Don’t expect much support or access to the best features. LibreOffice Online, much like other free solutions, isn’t a good option for business. It’s a community-led program, so you can’t expect support or for it to adhere to the best security standards. If you need something in a pinch, though, or you’re an individual user, it’s not a bad choice. While G Suite apps allow for offline editing, Office 365 plans include full desktop versions of Microsoft’s various programs (in addition to the online, browser-based versions, of course). Office 365 apps can be installed on up to five phones, five tablets and five PCs or Macs per user. Support for Office 365 is excellent, and it can be provided by a local supplier like TMB. It’s fully licensed for commercial use. Most people use Microsoft’s document formats, and Office 365 obviously has the best compatibility for them. Every Exchange Online user gets a 50GB mailbox and a custom email address. 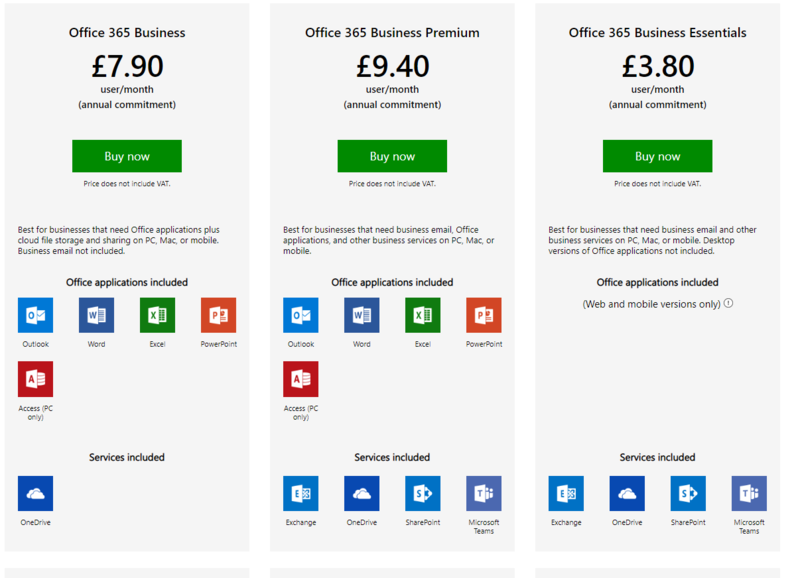 Office 365 is available to businesses for as little as £3.80 per user per month. The cheapest G Suite price is £4.60. Excellent security, which can be boosted with additional services such as Intune and Office 365 ATP. Quite simply, Office 365 is the best productivity suite on the market. The are lots of great alternatives, including many we haven’t mentioned here, but Microsoft’s solution is leading the way for a reason. Microsoft, under its current CEO, Satya Nadella, has put a great deal of effort into making its products more appealing to consumers and businesses, and that work is paying off. The firm has created a product that is powerful, innovative and secure, and it’s built on Microsoft’s Azure cloud technology, which itself has an impressive rate of uptake – quickly catching up with the market-leading Amazon Web Services (AWS). If you’d like more information about Office 365 for business, give us a call on 0333 300 9050. Prev Previous Windows SQL Server 2008/2008 R2 Support Ends In Three Months. What Should You Do Next?